Mumbai: Now isn’t it everyone’s dream to act, talk, dance, like Shahrukh? 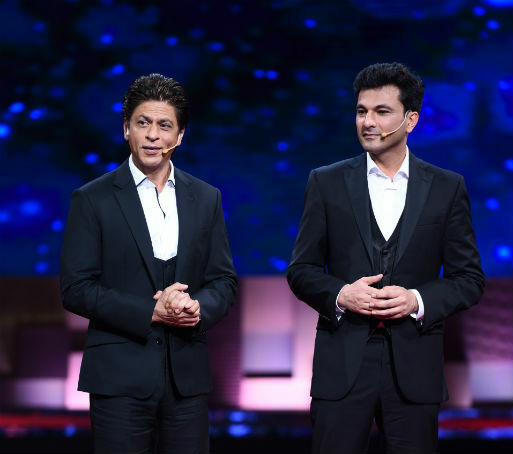 Well, Chef Vikas Khanna’s dream came true on the stage of TED Talks India Nayi Soch as the two were twinning on the show. King Khan and Vikas Khanna will be seen wearing a black suit with a white shirt with similar cut waist coats. To this Shahrukh instantly requested for a picture as he wanted to keep this as a reminiscence. “Wow, we’re twinning, I would like to keep this day as a memory and would definitely take a picture with you in this,” said SRK. The upcoming episode titled ‘Pursuit of Happiness’ will see a number of speakers sharing their quest to find happiness in the things they do. Along with Vikas Khanna who will be sharing his personal stories on he went on to becoming a guy with polio, to one of the best Chefs of the world, we will see actor-director, Danish Hussain’s humours take on Happiness. We will also see anthropologist, Sarovar Zaidi whose work focusses on religious architecture in Mumbai and its relationship to the larger neighbourhood, municipal planning and urban space of the city. A software engineer, Supriya Joshi, founder of Swashikshan (self-teaching) movement which has at least 1,000 home-schooling parents as members. A mother of two, she took her daughters out of school to home-school because she wanted them to be happy.